Yesterday I woke and immediately started daydreaming about Sunday breakfast. With all the writing and social networking that goes with my job(s), sometimes I just get cranky for time IN the actual kitchen. Crepes. I don’t know why, but I started daydreaming about crepes. Filled with eggs and goat cheese and something bright colored to remind me what spring looked like. 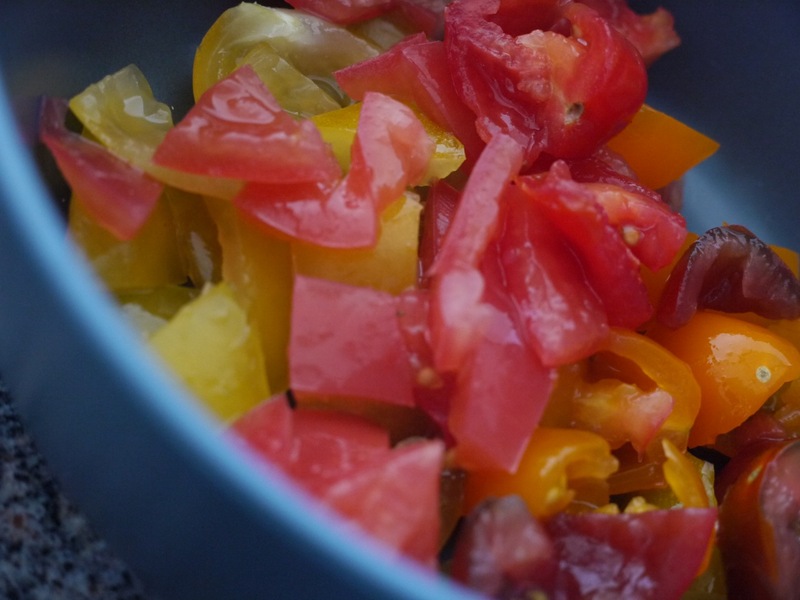 Luckily I was only a few blocks from Whole Foods, where a bunch of gorgeous little tomatoes from Mexico found their way into my basket, along with some fresh cilantro and small Mexican champagne mangoes. The sun was out, the air was warm, I walked home with my jacket unbuttoned and my raggedy hair blowing in the wind. New Yorkers had a bit more of a spring to their step, and I didn’t realize at the time how this quick break from the cold would make smiles turn up a bit more on most of the lovely people I’d encounter in my day. Anyway, back in the kitchen. 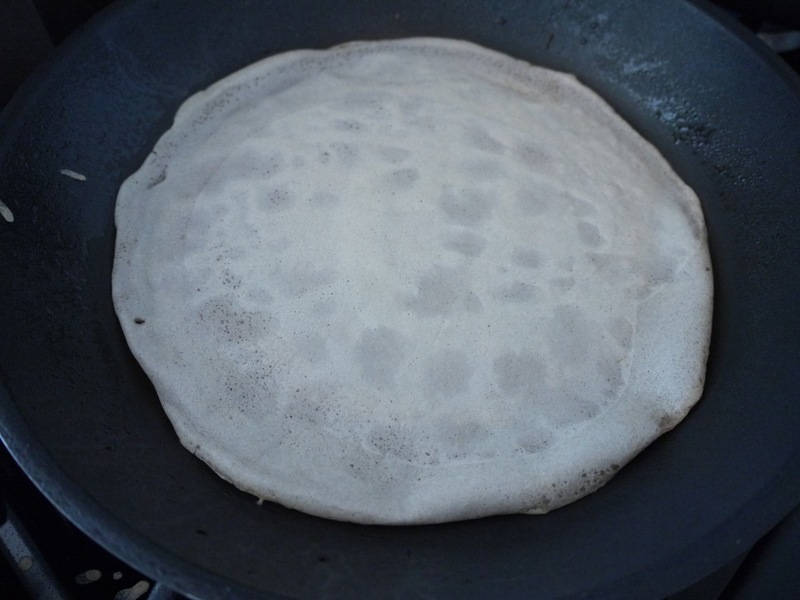 I had decided on using a little buckwheat – which is common in some crepe recipes but used sparingly as it can be a bit bitter – and tapioca flour to pull along with the eggs and soymilk I was using for the crepe batter. A tiny bit of butter and salt, and that’s it! 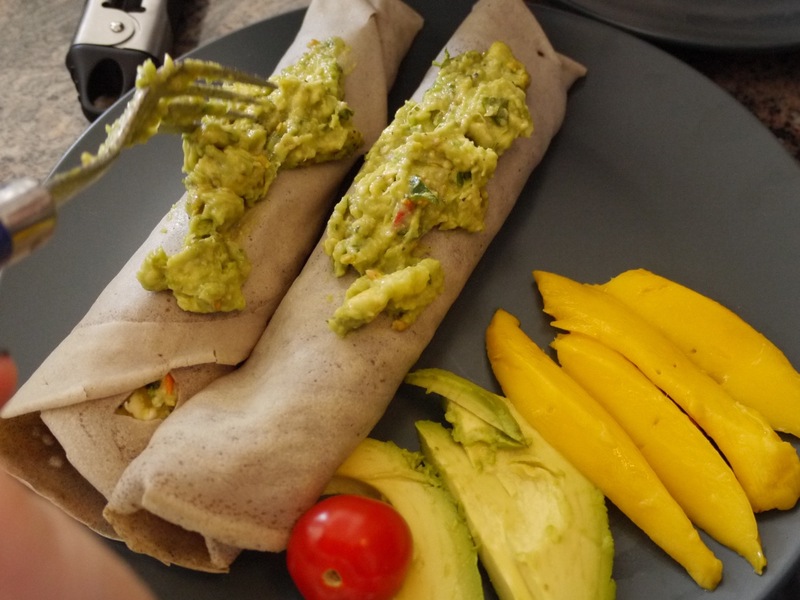 I utilized the whipping strength of a blender and the ease of a non-stick skillet to aid in making sure that the eggs would be beaten light and fluffy and the crepes easy to flip. When the first one actually WORKED I called my boyfriend to the stove, giddy like a school-child out the first day of holiday. We delighted in a few seconds of cheery contentment, flipping gluten-and-dairy-free crepes onto a waiting pan while eggs slow-cooked nearby. 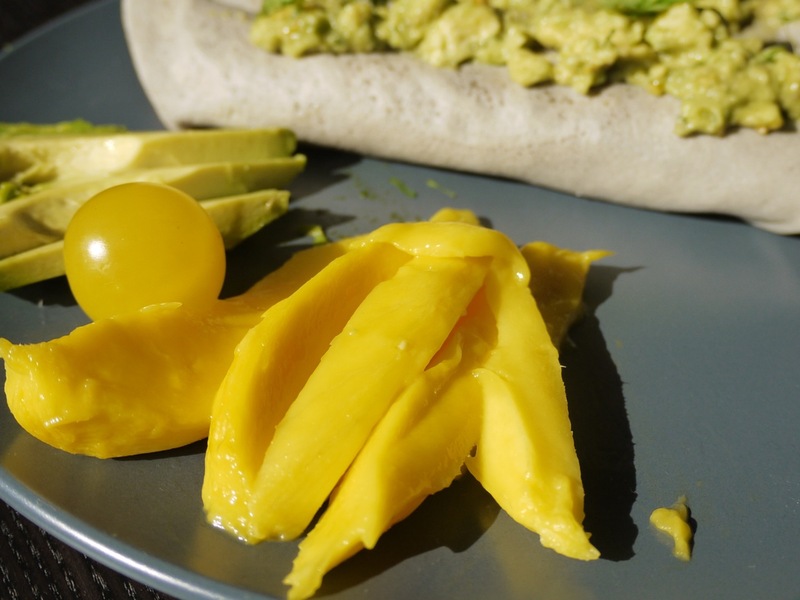 This recipe is quite simple, and quick, and with a little practice I soon had a stack of warm crepes that I filled with sauteed eggs and served with a guacamole-type mix and the freshly sliced champagne mangoes. It was a good, good, good day. Whip eggs and milk of choice in blender until creamy and a bit fluffy (if you don’t have a blender you can use a standing or hand mixer, or just whip the heck out of them with a whisk). Add the flours 1/3 a cup at a time, whipping thoroughly with each addition. Add the melted butter or oil and salt and whip quickly to incorporate. Heat a large non-stick skillet on medium high heat and spray lightly with cooking spray. Hold skillet away from heat and let cool for 5 seconds, then pour enough batter in the center of the skillet, swirling quickly to cover the entire surface, until the bottom of the skillet is just covered with batter. 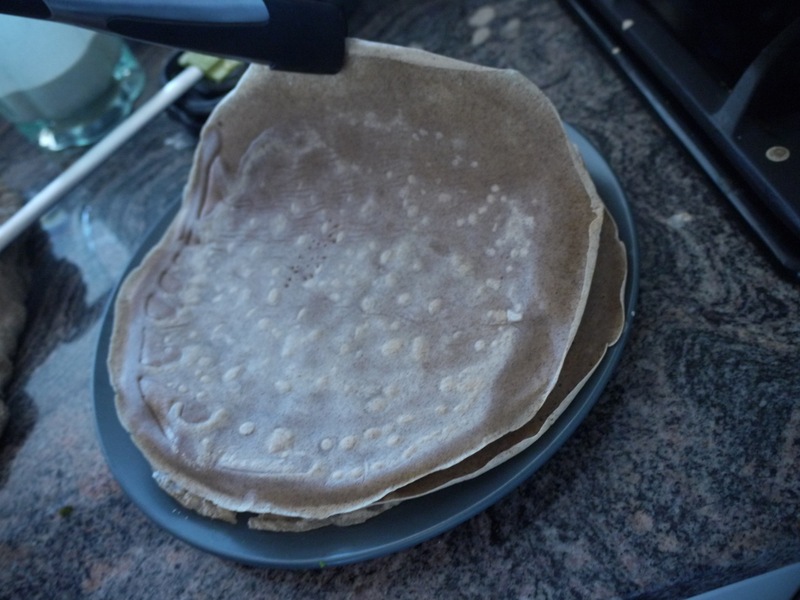 Return to heat and cook for 15-20 seconds or until the sides of the crepe start to curl. Flip gently and cook on the other side another 20 seconds. Remove to plate. Repeat until you get a pretty stack of crepes! 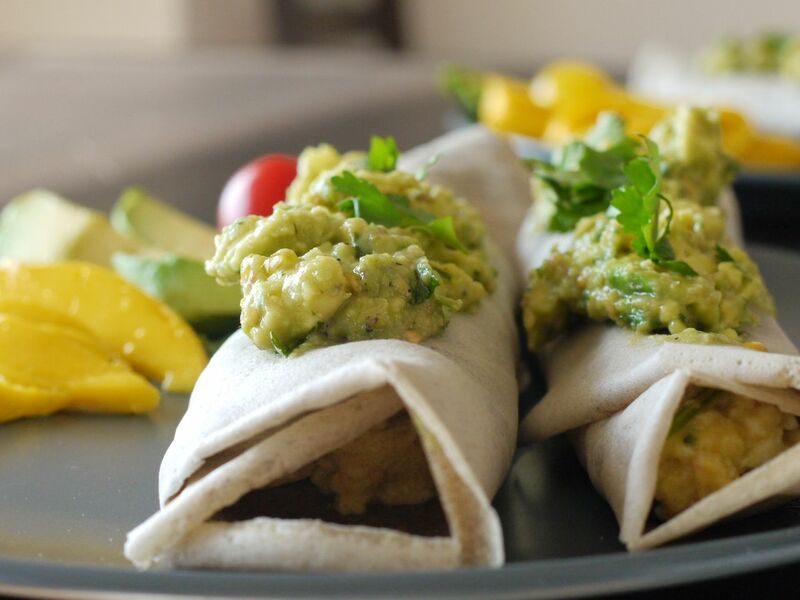 I then reserved the insides of them and mashed them with avocado, more cilantro, a squirt of fresh lemon juice (in the absence of lime) and some sea salt and pepper. And then adorned the dish with the fresh champagne mangoes. They’re a little tarter, firmer and less fibrous than regular mangoes. While the tomatoes weren’t quite what I wanted (beautiful in color but still lacking that perfect summer tomato sweetness), it was a gorgeous dish, paired with orange juice and locally roasted coffee. The perfect start to one of the best Sundays I’ve had in a long while.